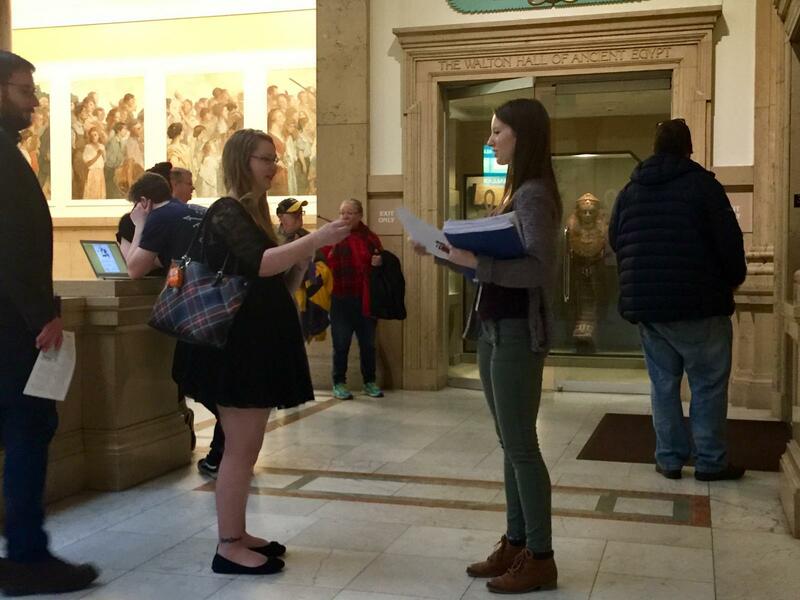 As an undergraduate student who is double majoring in Anthropology and Art History with a Museum Studies minor, I was overwhelmed when offered the opportunity to work side-by-side with Dr. Erin Peters, assistant curator at the Carnegie Museum of Natural History, during the initial stages of development for the institution’s new ancient Egyptian exhibit. 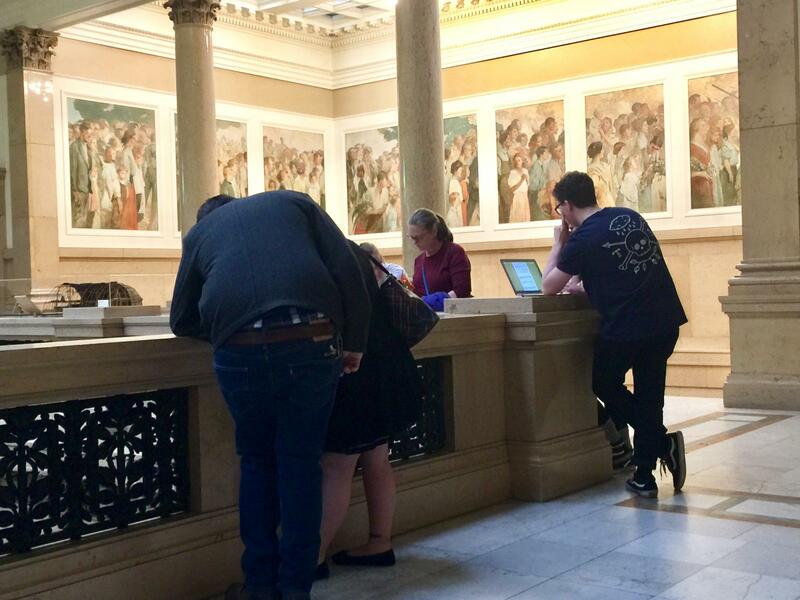 I began my position as a curatorial intern by reading articles and reports as background information, which explained how audience evaluations are designed, implemented, and reported in a museum. After this initial research, I developed my own audience evaluations that I then conducted on visitors of the Walton Hall of Ancient Egypt. Two evaluations resulted in the form of questionnaires. The first was a summative evaluation of the current exhibit, while the second utilized front-end methodology focusing on the ideas that have been formulated for the new exhibit. I spent approximately 24 hours and 55 minutes conducting these evaluations, receiving a total of 86 responses for the summative questionnaire and 83 responses for the front-end survey. I then analyzed the results and produced a report that will be included in the institution’s proposal for the new Egyptian exhibit, “Egypt on the Nile”. In this report, I drew conclusions about visitors’ responses and made suggestions regarding the modification, addition, or elimination of elements included in the current ideas for the new exhibit. Through my work with Dr. Peters, I learned valuable information about audience evaluation techniques and the process of designing new exhibits in museums. Additionally, the challenges that arose resulted in beneficial learning experiences. From the implementation of my evaluations, I learned about the different sampling techniques that can be utilized. After attempting to offer my questionnaire to every fourth group exiting the exhibit, I found that the varying amounts of time that participants took to complete the survey restricted me from doing so, as I only had one laptop on which the questions could be completed. Because of this difficulty, I decided to change my evaluation methods for the second questionnaire. I then had both a laptop and paper surveys available so that multiple participants were able to complete the questionnaire at one time. This allowed me to ask every group that exited the Walton Hall of Ancient Egypt rather than waiting for every fourth group. These methods proved to be much more successful and brought an increased amount of consistency to the implementation of my evaluations. Because I hope to work at either an art or natural history museum in the future, possibly in exhibit design or educational programming, this position provided me with significant real-world experience in a museum setting. My internship allowed me to expand my understanding of museum evaluation techniques, technical writing and reporting, and the various roles that work together to create a new museum exhibit.